Increased financial incentive levels available until April 30, 2019! 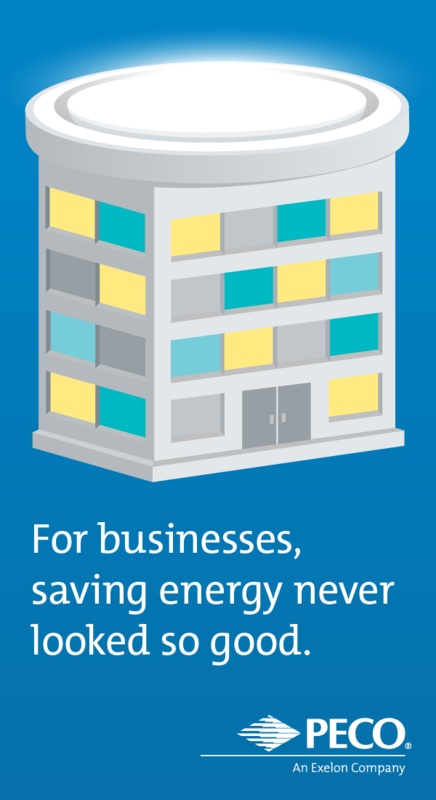 PECO offers more ways to help businesses save with increased financial incentive levels until April 30, 2019 on a variety of popular energy efficiency upgrades. * To learn more, call 1‑844‑4BIZ‑SAVE (1‑844‑424‑9728), or complete the form on this page to get started. Qualifying equipment is subject to specifications, terms and conditions as outlined in the program application and application manual for Phase III. Increased incentives are available until April 30, 2019, or while funds last. All other incentives are available until May 31, 2021, or while funds last. See all our financial incentives below. Interior Central Lighting Controls $0.0175 Sq. Ft.
CHANGED Retrocommissioning, Whole Building for Large Commercial Customers $0.06–$0.20* Sq. Ft.
CHANGED Retrocommissioning, Whole Building for Small Commercial Customers $0.05–$0.15* Sq. Ft.
≥ 10% and < 20% of Code $0.035 Sq. Ft.
≥ 20% and < 30% of Code $0.07 Sq. Ft.
≥ 30% and < 40% of Code $0.105 Sq. Ft.
≥ 40% of Code $0.21 Sq. Ft.
11%–20% Improvement Over Code $0.155 Sq. Ft.
21%–30% Improvement Over Code $0.233 Sq. Ft.
31%–40% Improvement Over Code $0.350 Sq. Ft.
41%–60% Improvement Over Code $0.525 Sq. Ft.
> 60% Improvement Over Code $0.700 Sq. Ft.
To discuss a project, call us at 1-844-4BIZ-SAVE (1-844-424-9728). *Increased incentive levels available as of May 1, 2018, through April 30, 2019, or while funds last. **New construction interior lighting controls and exterior lighting power efficiencies that exceed code will be incentivized as custom measures using $0.05/kWh rate. Increased incentive levels are also available for Multifamily customers including apartments, condos and assisted living facilities. To learn more visit peco.com/multi. Note: Specific equipment will determine the exact incentive level when an incentive range is provided. For more information on PECO energy efficiency solutions for your business, please complete the information below. Search for a contractor by services or location.